When you enter a japanese ramen house and are greeted by "Isharmase" (a butchered version of irashaimase--hello), that's usually a prompt to bolt out the back door...fast! Although they try to mask it with j-pop in the background and an overall japanese feel, there's no mistaking that this restaurant is owned and operated by Chinese. Not that I have anything against this, but it just felt awkward and unexpected as I first walked in. The menu had plenty of photos and it took me about 5 minutes of scanning to realize that they don't have any of the traditional ramens like shoyu. I take that back. They might have them but with untraditional toppings. After looking at pictures of 'Tenderous Ribs Ramen", "Pork Cutlet Curry Ramen", "Beef Ramen", and "Premium Pork Ramen", I finally settled on the Premium Pork Ramen. I held off on the gyoza this time since I couldn't find a combination that I liked and I sure enough wasn't gonna eat 8 pieces by myself. Premium Pork Ramen: The ramen arrived within minutes of ordering but I thought the bowl looked unusually small. Fortunately it was still packed with enough noodles to fulfill my starvation. This ramen was very flavorful and I enjoyed it very much (at the time I was eating it) but before I go any further I have to mention that the MSG content was insane!! When I got home I filled my bathtub full of water and my tongue sucked it up within seconds! Okay that's a slight exaggeration but more than just an estimation of how my tongue feels. If you have a high MSG tolerance, then you should check this place out but be aware! If you can't stand MSG, then don't even bother. On a side note, this ramen was also very garlicky and the soup base was tonkotsu. Excuse me waiter, more water please!!! At first I thought Ajisen is operated by Chinese. But it looks like it's more complicated, it's a Japanese company from Kumamoto, but has recently expanded around the world with a Hong Kong based joint venture. But you are right their menu is totally not traditional -- the local branch will create ramens to suit local taste. Thanks for the links Richard. You're right, it is fairly complicated. 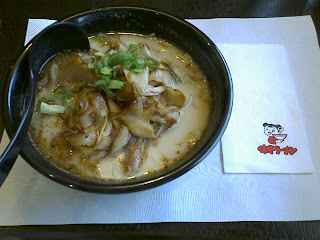 I wish I could have tried Shigemitsu-san's ramen from the 60's. It was probably way better than Ajisen today. So...they opened and Ajisen here in San Francisco. I got to try it and it wasn't too bad. I had the Ajisen ramen...since it is the one named after the place. The soup was nice but a bit garlicy for me. They did have shoyu but I saw it too late. I think overall...it was ok. For $7.50, it was good.